A successful business man, after many years of hard work and effort, had built his company where he could afford to provide a specially built home for his wife and family. They selected a lake front property, had the entire landscape designed for a relaxation and enjoyment, had a phenomenal pool designed within their own private haven. 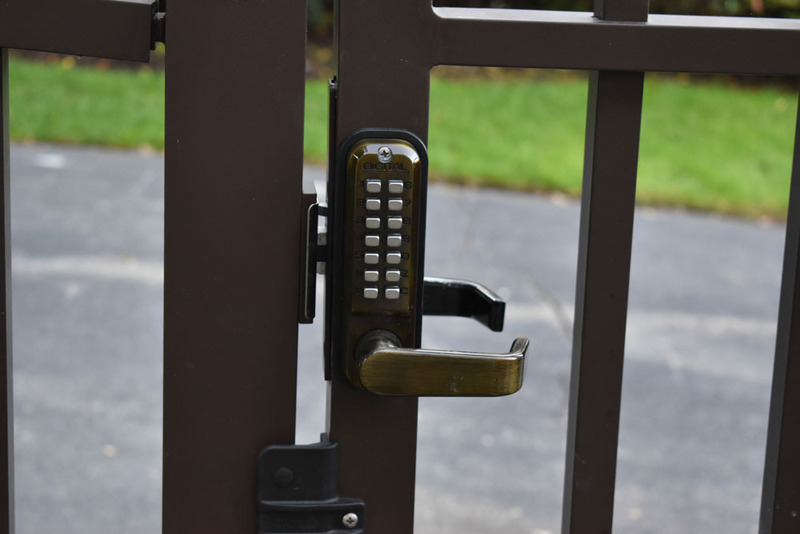 Security became important, not only executive or personal security, but also, they desired uncompromising physical, property and estate security so that they could continue their lifestyle uninterrupted. However, they had 3 major challenges. #2 all access points had to seamlessly integrate into their Lutron Smart Home Security System. #3 the property needed to be secure in time for a son’s graduation party, only 5 months away. They contacted us and dialogue immediately started on all 3 levels: Design, Security/Automation and Time Frame. Design: The executive wanted beautiful security, that enhanced the architecture of the house, planting design, and overall visual wow factor of the property. He also wanted his personal touch to the design, that the project is uniquely his. All the materials needed to withstand the waterfront environment. 1” solid aircraft grade aluminum pickets were selected for mass, strength and character. 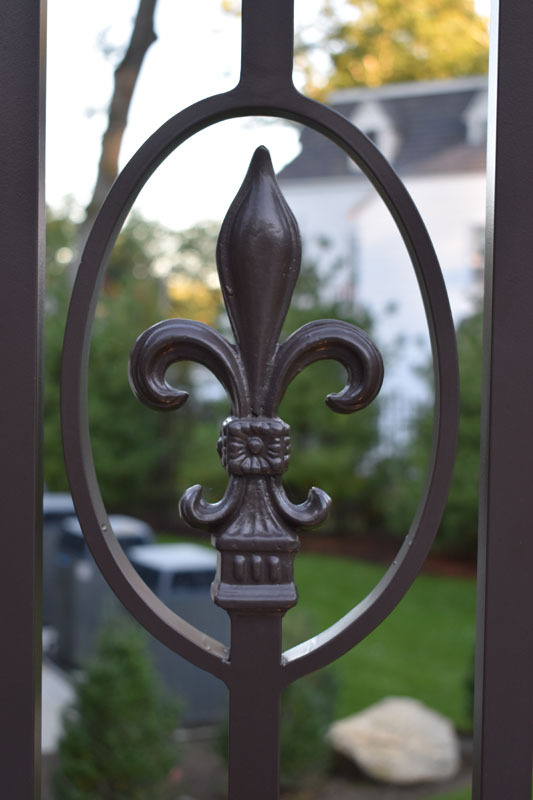 He selected a prestigious fleur-de-lis finial, we custom designed a hand forged oval to accentuate a line of finials at mid-height of fence. At the bottom of the fence, a custom designed, forged, and pierced C-scroll. 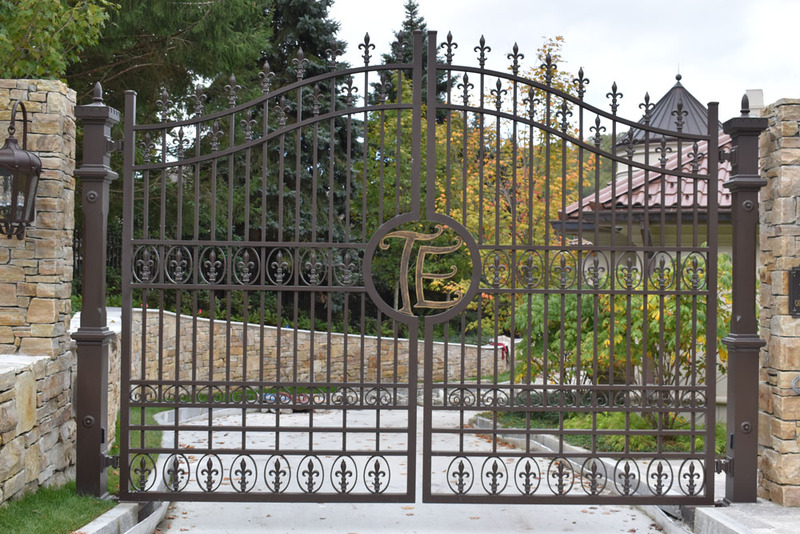 The gate was designed to be 12’ tall for both visual deterrent and wow factor. 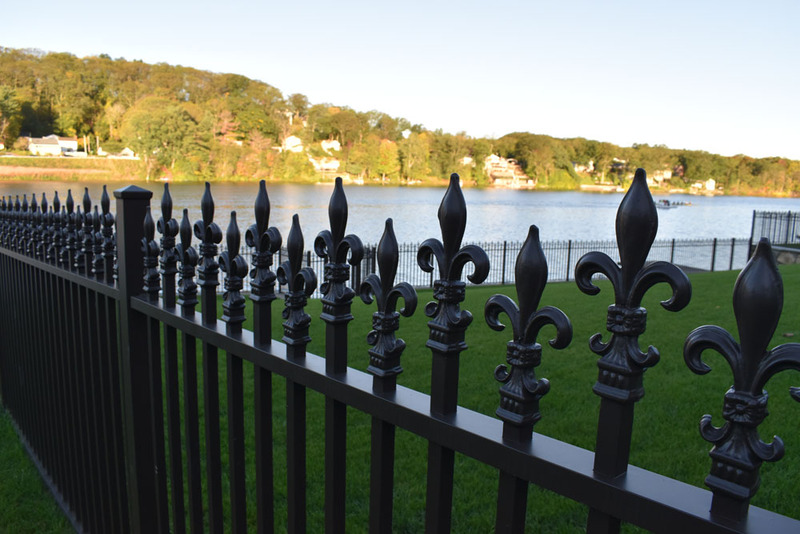 After evaluating budget, most of the ornamental design elements of the security fence were concentrated on the front visual aspect of the property. This part of the fence was also built to 7 ft tall to minimize climb-ability for any intruder or predator. All cast material was custom created in marine grade to provide durability needed in the waterfront environment. 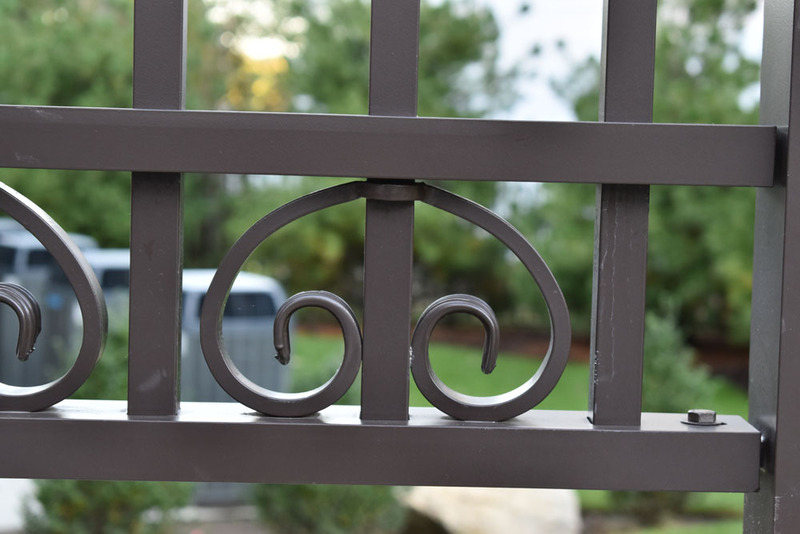 The client’s initials were centrally located in the gate design. Access Control/Security: The level of collaboration and dialogue we provided directly with electrician and security companies to have all the access points integrated directly unto the Lutron Smart Home System made life much less hassle for the client. All hardwiring, wifi and connection points were discussed proactively for a seamless install. All primary gates had call boxes that reported to the central security platform. All Secondary access points were provided with coded, keyless entry. The client wanted AVI (Automatic Vehicle Identification) installed on all 6 of the family’s vehicles. Time Frame: Time was of the essence. The entire property was efficiently measured and elevation points shot. Everything was designed in CAD and submitted for prompt approval by the client. Certain benchmarks were identified for the team of craftsmen to obtain in order to be eligible for bonus money. The entire team of craftsmen worked very hard, late and efficiently to bring this project in on schedule. And with a strategic planning for the install, it went slightly ahead of schedule. The neighbor, the landscaper, the builder and the client were absolutely thrilled with the complete project. 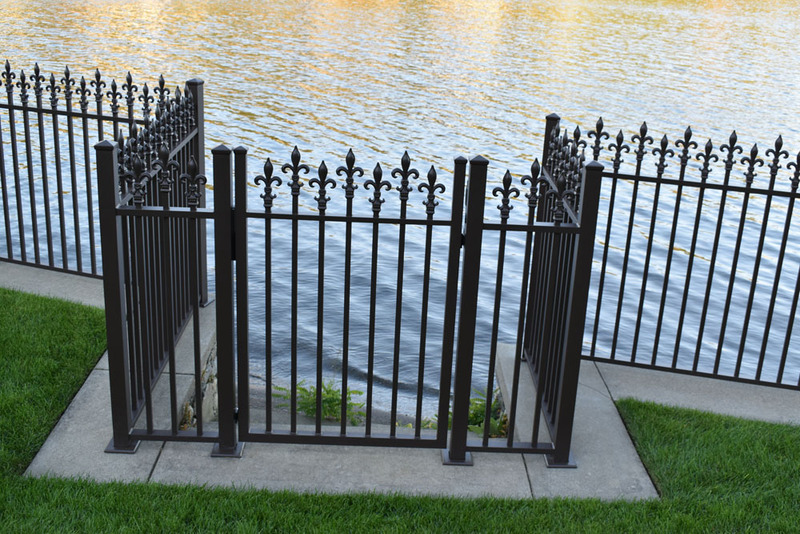 The uncompromising yet beautiful property fence provides peace of mind and security for all family members and their property assets.